David Lane, a revered figure among white nationalists, died May 28 at the age of 68 in a Terre Haute, Ind., federal prison. Lane was serving a 190-year sentence for racketeering, conspiracy and violating the civil rights of Denver talk radio host Alan Berg, who was assassinated in 1984 by Lane and other members of the Bruders Schweigen, or Silent Brotherhood, a terrorist group also known as The Order. Lane's death touched off paeans from racists around the country and abroad. June 30 was designated a "Global Day of Remembrance," with demonstrations held in at least five U.S. cities as well as England, Germany, Russia and the Ukraine. Neo-Nazi activist April Gaede, a Kalispell, Mont., resident who corresponded frequently with Lane, announced with great fanfare that she and "the gals from WAU [Women For Aryan Unity]" had established a David Lane Memorial Fund to cover the expenses of interring Lane's remains. 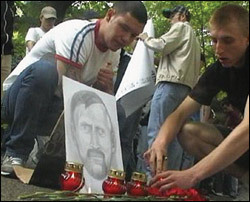 One of many rallies commemorating the late David Lane took place in Kiev, the capital of the Ukraine, where some 100 people marched to the U.S. embassy carrying candles and pictures honoring the American far-right terrorist. The marchers were organized by two neo-Nazi groups, Blood & Honour Ukraine and the Ukrainian National Labor Party. According to Gaede, Lane told her that he wanted to be cremated and have his ashes placed in the capstone of a pyramid monument. However, Gaede wrote on the racist online forum Stormfront, "Since we are not in a situation to build a monument in a White homeland," Gaede was arranging to instead distribute Lane's ashes among 14 smaller, portable pyramids, which would then be enshrined in the homes of 14 white nationalist women. (The number of pyramids is a direct reference to "the 14 words," the white nationalist catchphrase authored by Lane: "We must secure the existence of our people and a future for white children.") Lane's body reportedly was cremated in early June after a private ceremony near Kalispell. The Portland, Ore.-based skinhead gang Volksfront claimed online to have donated $1,000 to the memorial fund, and dozens of registered users on Stormfront and other racist online forums such as Vanguard News Network posted emotional tributes to Lane along with reports of mailing Gaede their own, smaller donations. Tom Metzger, a well-known neo-Nazi ideologue, accused the government of "murdering" Lane by transferring him to the federal penitentiary shortly before his death. "They knew how bad his heart was but they did it anyway," Metzger wrote on Stormfront. "We probably will never know what they did to him at Terre Haute. I assume it was pretty rough treatment. Never Forgive. Never Forget." Others remembered Lane differently — as the driver of the getaway car for the Silent Brotherhood gang that machine-gunned Berg to death in the driveway of his home. Berg had irked white nationalists with his radio commentary.